Sept 1994 “Klein Sprachdiplom” in German fluency (Goethe Institute, Berlin). Prof Coupland’s clinical and scientific research focuses on molecular genetics of cancers with particular interests in uveal melanoma; conjunctival melanoma; intraocular and ocular adnexal lymphomas; and CNS lymphoma. She is involved in translational studies of various clinical trials. 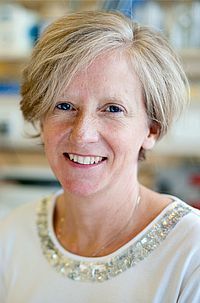 Sarah is a Consultant Histopathologist and the George Holt Chair of Pathology, University of Liverpool. She is also Deputy Head of the Dept. of Molecular and Clinical Cancer Medicine; Director of the Liverpool Tissue Bank; and the Interim Director of the CRUK Liverpool Centre. Kujala E, Damato B, Coupland SE, Desjardins L, Bechrakis NE, Grange J-D, Kivela T.
Staging of ciliary body and choroidal melanoma based on anatomical extent: a collaborative study of the European Ophthalmic Oncology Group (OOG). Lake SL, Damato BE, Kalirai H, Dodson A, Taktak AFG, Lloyd BH, Coupland SE. Single Nucleotide Polymorphism Array (aSNP) analysis of uveal melanomas reveals that amplification of CNKSR3 Is correlated with improved patient survival. American Journal of Pathology, 2013 Jan 25. Marshall E, Romaniuk C, Ghaneh P, Wong H, McKay M, Chopra M, Coupland SE, Damato BE. MRI in the detection of hepatic metastases from high-risk uveal melanoma: a prospective study in 188 patients. Br J Ophthalmol. 2012 Nov 17. [Epub ahead of print] PubMed PMID: 23159448. Khan S, Finger PT, Yu GP, Razzaq L, Jager MJ, de Keizer RJ, Sandkull P, Seregard S, Gologorsky D, Schefler AC, Murray TG, Kivelä T, Giuliari GP, McGowan H, Simpson ER, Corriveau C, Coupland SE, Damato BE. Angle involvement and glaucoma in patients with biopsy-proven iris melanoma. Angi M, Kalirai H Coupland SE, Damato B, Semeraro F, Romano MR.
Ramkumar HL, Shen DF, Tuo J, Braziel RM, Coupland SE, Smith JR, Chan CC. IL-10 -1082 SNP and IL-10 in primary CNS and vitreoretinal lymphomas. Investigative Ophthalmology and Visual Science, 2012 May 4;53(6):2647-52. Kalirai H, Damato B and Coupland SE. Uveal melanoma cell lines contain stem-like cells that self-renew, produce differentiated progeny and survive chemotherapy. Lake SL, Jmor F, Dopierala J, Taktak AFG, Coupland SE and Damato B. Investigative Ophthalmology and Visual Science, 2011 Jul 29;52(8):5598-604. Damato BE, Eleuteri A, Taktak AFG and Coupland SE. Estimating prognosis for survival after treatment of choroidal melanoma.